The Ohio Division of Wildlife will stock Turkey Creek Lake with trout just prior to the April 28 Trout Derby so that the chances are better for catching a fish. Jenny Richards, a naturalist at Shawnee State Park, says she believes the record catch was 26 inches long, with winners usually reaching between 23 and 26 inches. 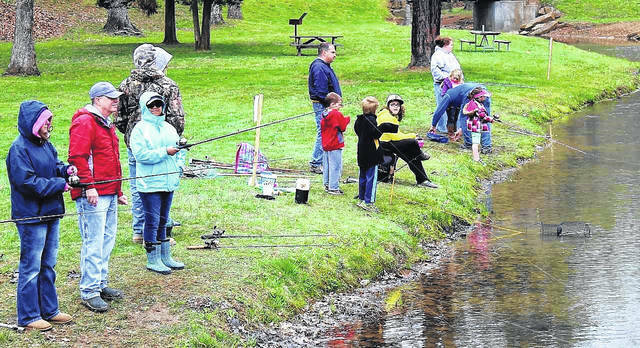 The 52nd annual Trout Derby, sponsored by the Portsmouth Area Jaycees and the Friends of Shawnee State Park, is set for April 28 on Turkey Creek Lake in the state park, 4404 State Route 125 in West Portsmouth. Attendance figures for the free event are weather dependent, according to Jenny Richards, a naturalist at Shawnee State Park. “Usually, by about 6 a.m., the lake is covered with boats,” she adds. Derby Day runs 6 a.m. to 2 p.m. Participants can register their bigger catches for prize eligibility in a tent to be set up next to the log cabin at the Turkey Creek Boat Ramp. Richards says the top prize is, as has almost always been the case in the history of the derby, a boat. While you won’t win a yacht, you could take home a bass boat, possibly complete with a motor, Richards says. She adds she believes the record catch was 26 inches long, with winners usually reaching between 23 and 26 inches. The Ohio Division of Wildlife (ODW) stocks the lake with trout just prior to the derby. The exact day is kept under wraps so anxious anglers don’t attack the lake prior to the derby. In addition to the main contest, the event also includes a kiddie fishing area for children 12 and under. Youngsters are invited to throw their lines in the water at Turkey Creek Beach. Richards says 30 fish will be tagged and released near the beach for children to catch. Young anglers reeling in a tagged fish win a prize. In addition to all the fishing, the ODW puts on what Richards calls a fish shocking demonstration from 1 to 3 p.m. the day of the derby. “It’s really very interesting and fun,” she says. Essentially, the ODW brings in a special boat equipped with electrified poles which are stuck into the lake. The current temporarily stuns the fish in the water, causing them to rise unconscious to the surface. The fish are then collected and brought to shore in buckets. Richards says ODW experts then spend time talking about each breed before the fish are released back into the lake. Fish in the lake range from bass to catfish to bluegill to crappie, among others. Free boat inspections by the Division of Parks and Watercraft are available 5 to 8 p.m. the day prior to the derby. New to the overall event this year is a camping program set to begin at 6 p.m. April 27. Richards says it is aimed at families and young children, and describes it as “Camping 101,” and will include campfire cooking and paddling on Turkey Creek. The program will be presented by Richards and the chief ranger of Camp Oyo. The program is limited to 20 families total, and Richards says several already have signed up. There is a $20 fee for the program, with proceeds going to the Friends of Shawnee State Park. Participants must pay by check, but Richards says checks will not be cashed until the event, just in case the program is scratched due to bad weather. Call 740-858-6652 to register or for more information. 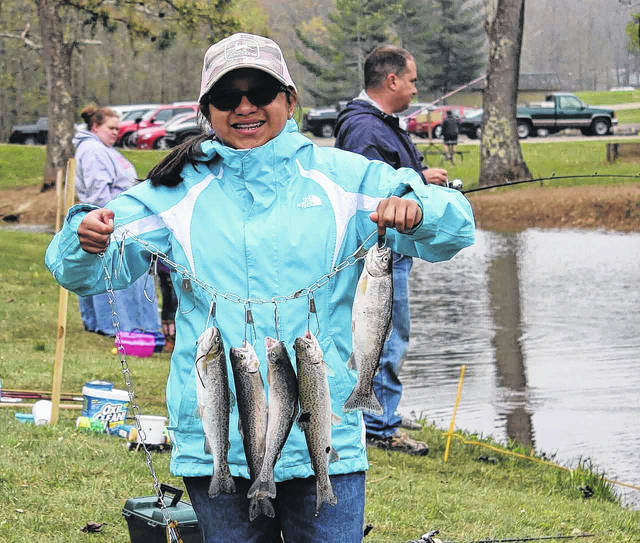 https://www.portsmouth-dailytimes.com/wp-content/uploads/sites/28/2018/04/web1_Fishing-1-1.jpgThe Ohio Division of Wildlife will stock Turkey Creek Lake with trout just prior to the April 28 Trout Derby so that the chances are better for catching a fish. 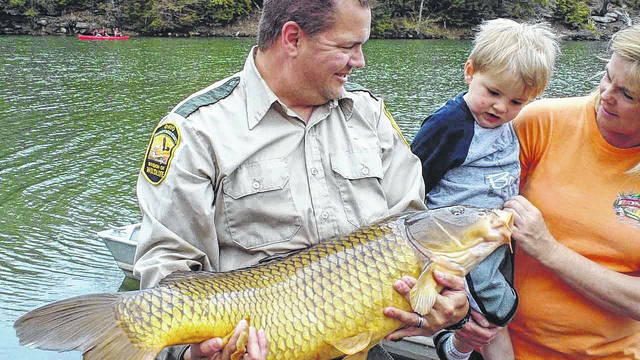 https://www.portsmouth-dailytimes.com/wp-content/uploads/sites/28/2018/04/web1_Fishing-2-1.jpgJenny Richards, a naturalist at Shawnee State Park, says she believes the record catch was 26 inches long, with winners usually reaching between 23 and 26 inches.